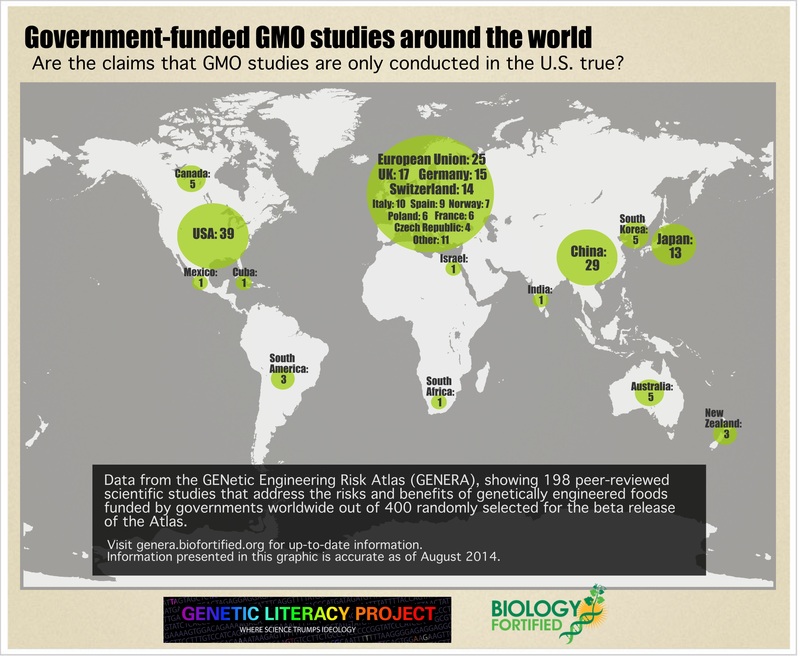 World Map of Government-Funded GMO Studies - Biology Fortified Inc.
What countries fund research on genetically engineered crops? Is it mostly funded by the US government? On August 25, 2014 the first data from the GENetic Engineering Risk Atlas (GENERA) project was released, and it can help us answer this question. The research is worldwide, and while concentrated in developed nations, some developing nations have contributed significantly to our understanding of these crops. For more information, see the GENERA beta test announcement. Biology Fortified collaborated with the Genetic Literacy Project on creating this infographic based on data from GENERA. Visit the GENERA website and search the atlas here. Each study in GENERA was analyzed for its source(s) of funding, which were categorized by type, such as government, various industries, NGOs, and individuals. Only studies that were solely funded by government sources were included in this graphic. The country that this funding originated from was also gathered for GENERA. The size of each circle is based on the number of studies funded by each country. Therefore, the relative number of studies in each position can be seen visually with both the relative size of the circle and the number inside (or next to) each circle. Because many studies were funded by individual European countries as well as from agencies of the European Union as a whole, one circle was created for Europe, with the numbers for each source listed. This infographic will be updated as more data becomes available from the GENERA project.